Here's a great gift for your crafty friend! Personalize it by choosing the base color and a name or special message that will be embroidered on the base. This item may take an additional 2-3 business days to ship. 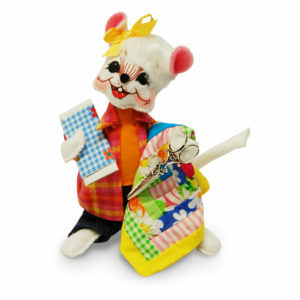 This mouse is a perfect gift for a variety of special occasions- celebrating a friendship, saying 'thank you', birthdays, or just because you care! It can be personalized by choosing the hair color and base color. Add a name, date or special message that will be embroidered on the base all for just $30! Honor your favorite first responder! Choose from Fire, Police, and EMT. The Fire Mouse wears a hat with the FD emblem and holds a red wooden ladder. The Police Mouse wears a hat with the PD emblem and holds a radio. There is a night-stick attached to his belt. The EMT Mouse wears a hat with the EMT emblem and a stethoscope around the neck. Personalize it by choosing the hair color, base color and a name or special message that will be embroidered on the base. Here's a customizable athlete mouse that makes a great gift or special keepsake for your sporty friend! It can be personalized by choosing the hair color and jersey color. Choose from a variety of sports- basketball, football, soccer and baseball/softball! Choose a base color and a name, team or school name, year or special message to be embroidered on the base. May take an additional 2-3 days to ship. This medical mouse makes a heartfelt gift for your favorite nurse or doctor, dentist, vet and more! Personalize it by choosing the hair color, base color and a special message to be embroidered on the base!